Check out our new look. 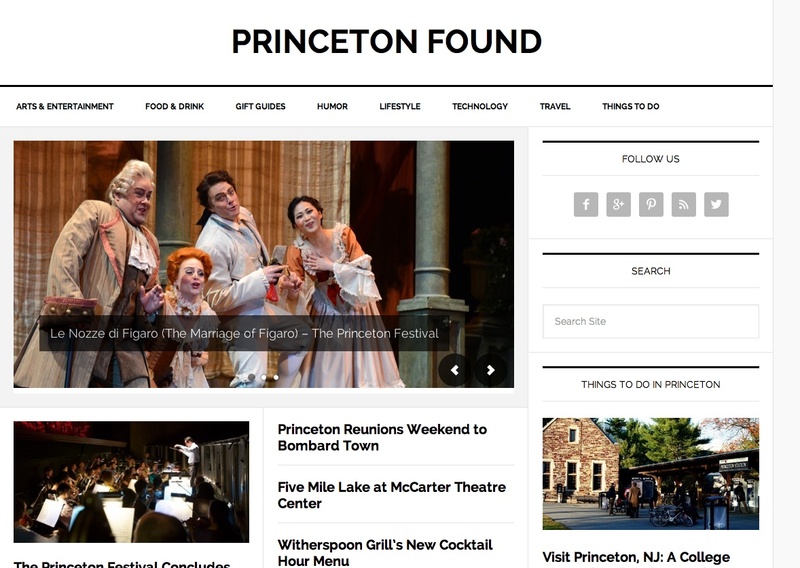 You can now find us at PrincetonFound.com. We will no longer publish new posts on this site, so please follow the above link, scroll to the bottom and subscribe to Princeton Found at our new location. Don’t forget to check the new site for recent posts that have not been published here. Let us know what you think about our new look. Scroll to the bottom, click on About, and make a comment or ask a question. We look forward to interacting with you at our new home. The Princeton Festival has brought Mozart’s Le Nozze di Figaro to our community. It is running in the Matthews Theatre at McCarter Theatre Centre. In 1786, it debuted in Vienna, and it is still one of the world’s top 10 most performed operas. The libretto is by Lorenzo da Ponte and is based on the play by Pierre Augustin Beaumarchais. Directed by Steven LaCosse, it is a wonderful follow up to the play performed at McCarter last season. For those who have not yet attended one of The Princeton Festival’s operas, let it be known that you will have a similar experience as being in an opera house. There is a live orchestra, it is sung in Italian with English supertitles (a simultaneous translation of the libretto shown on a small screen above the stage), plus you can purchase box and balcony seats, and no opera glasses are necessary. The opera began with the Overture before the curtain had risen. 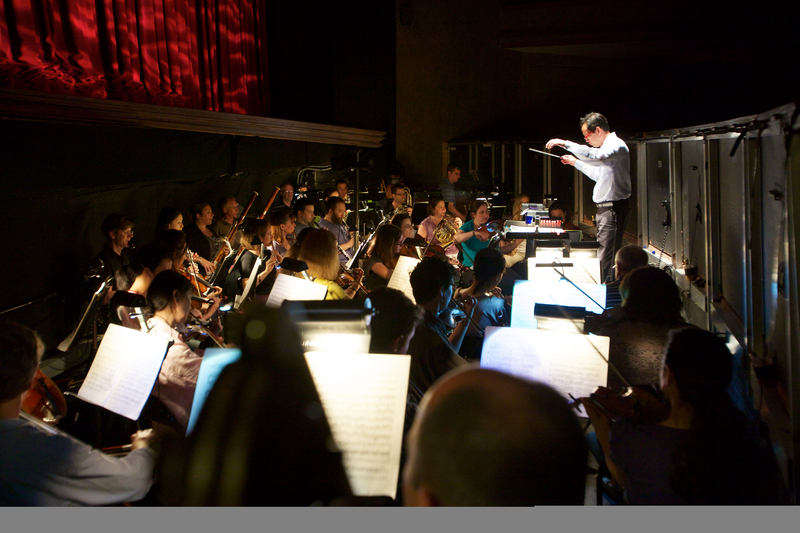 The 36-piece orchestra in the pit, conducted by Princeton Festival Artistic Director Richard Tang Yuk, performed it. It gave me gave me goose bumps. It is always a pleasure to concentrate on exquisitely played music upfront, because at times it can take a backseat to the action on stage. During the opera Yuk set the perfect tempi for the singers’ voices to saturate the air without lingering too long, giving it a natural flow. The orchestra was never too loud as to distract from the singing, thanks to the pit, but had enough volume for the music to be enjoyed and accentuate dramatic moments. The acoustics were quite nice, but different from large opera houses, since the Matthews Theatre only seats 1,100 and is not U-shaped. 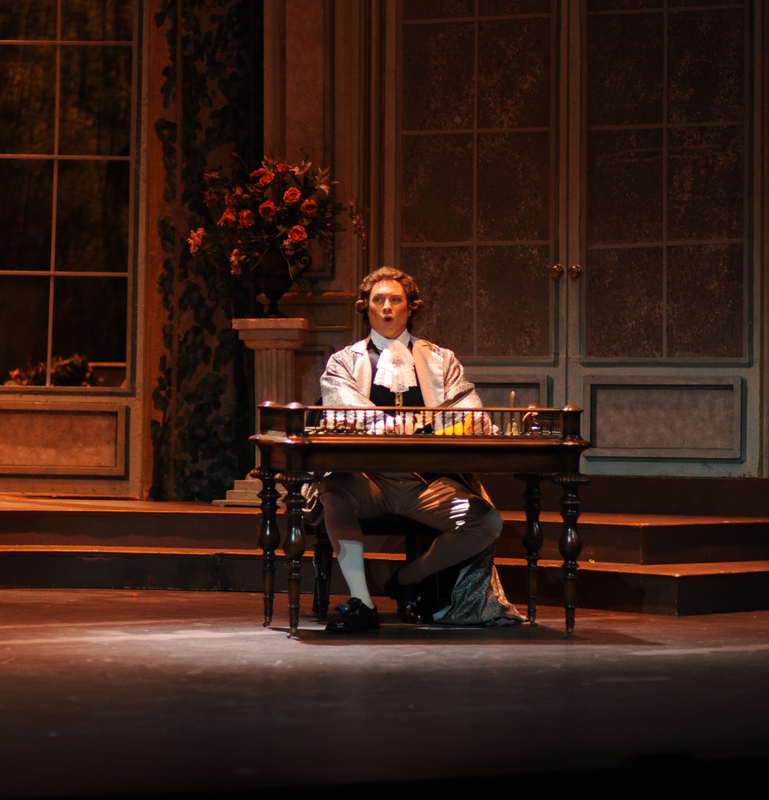 Le Nozze di Figaro takes place on a single day filled with “madness” in the palace of Count Almaviva (Sean Anderson). Dr. Bartolo (Ricardo Lugo) seeks retribution against Figaro (Jonathan Lasch) for foiling his plan to marry Rosina, who is now the Countess (Katherine Whyte). The Count was grateful to Figaro and has bestowed him employment, but the Count longs for Figaro’s bride-to-be Susanna (Haeran Hong). At one point Figaro, Susanna and the Countess plot to prank the Count by dressing his page Cherubino (Cassandra Zoé Velascco) in girl’s clothing posing as Susanna after she agrees to meet him in the garden. The Count overhears this ruse and attempts to force Figaro into marrying the very mature Marcelinna (Kathryn Krasovec). This is just a taste of the chaos that occurred all in one day. 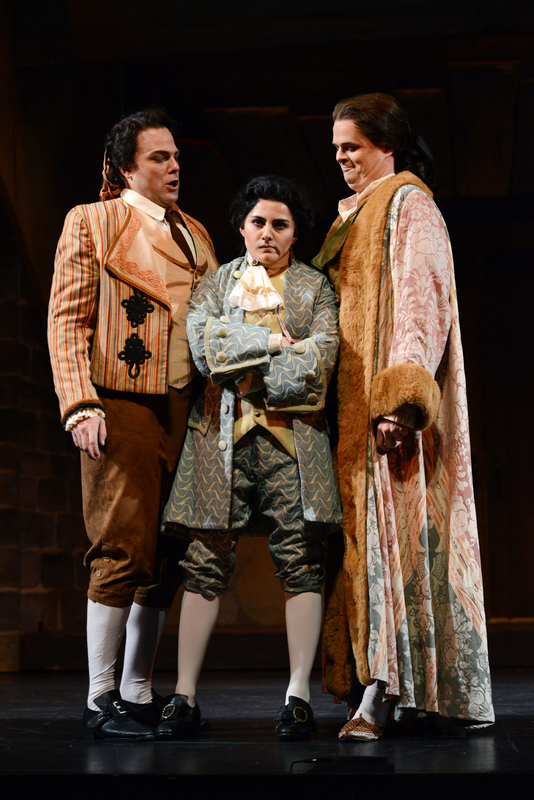 Other members of the cast included David Kellett as Don Basilio, Paul An as Antonio, Jessica Beebe as Barbarina, and Vincent DiPeri as Don Curzio. There was some slapstick and pandemonium to create the “madness”, yet the performers all stayed brilliantly focused. They kept the comedic timing on point to ensure that the humor was well delivered. The audience’s laughter could attest to that. Needless to say, the acting was spot on, and their voices were like velvet – smooth and rich. This production was visually stunning. The subtle tones of the amazing set design by Peter Dean Beck allowed the beautiful period costumes and wigs to shine. There was much attention to detail of this substantial set, which received part of the applause. The lighting highlighted subtleties without washing out the cast. Facial expressions, costumes, and set design all benefited from Norman Coates expertise. It was especially important in Act IV in the garden. It was dark enough to give the appearance of night, and allowed the illusion of lurking about, which accentuated the farce. However, it was balanced with enough illumination to allow the audience to clearly distinguish the cast. I watched this with a fan of the opera, who has never seen Le Nozze di Figaro and one who has never attended an opera. The former knew some of the music, and I could heard his faint humming of Non più andrai. The other, a total neophyte, was thrilled to have the support of supertitles. Both thoroughly enjoyed their experiences, from the acting to the music to the set and costumes. It was a wonderful introduction to opera for the novice, and the perfect opportunity to see one locally. They were pleasantly surprise to see a production of this magnitude in Princeton. LaCosse directed this opera with precision, as he exposed the relationships of the classes, and men and women within a royal court of the time. Lust, power, revenge, and collusion are all beautifully choreographed into a comedic romp that is sure to please. This extraordinary production is truly a gift to audiences, and a must see! 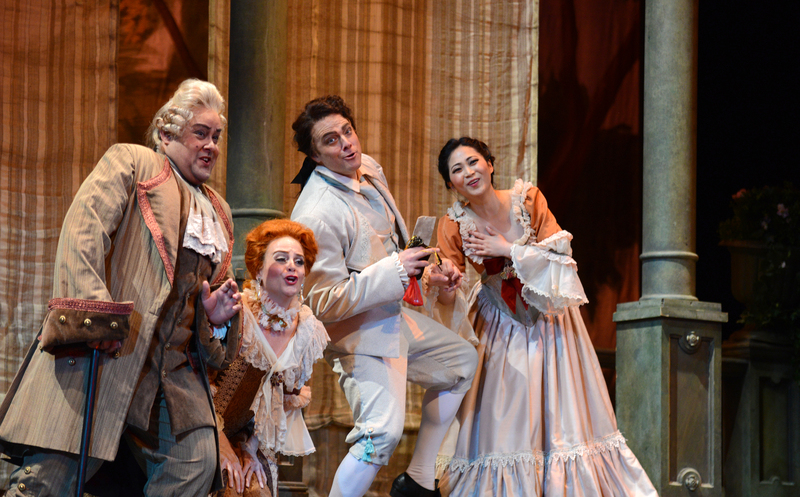 The Princeton Festival offers two more performances of Le Nozze di Figaro (The Marriage of Figaro) on June 21 and 28, both on Sundays at 3:00 PM. It has a run time of approximately 3 hours with two intermissions. You can get more information or purchase tickets here or call 609-258-2787 for tickets. 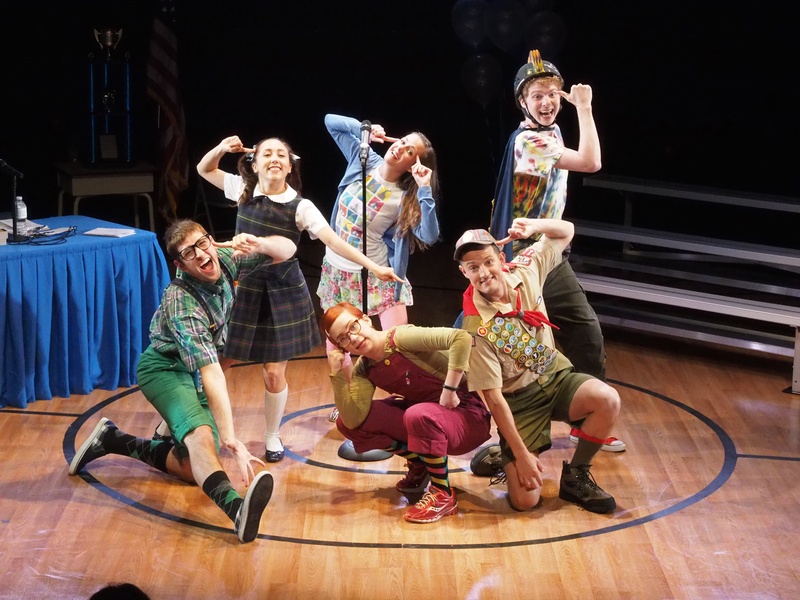 The Princeton Festival brings the former Tony Award-winning Broadway musical The 25th Annual Putnam County Spelling Bee to town. The book was written by Rachel Sheinkin, and directed and choreographed by Melissa Firlit. It’s playing in the Matthews Acting Studio in the Lewis Center for the Arts. 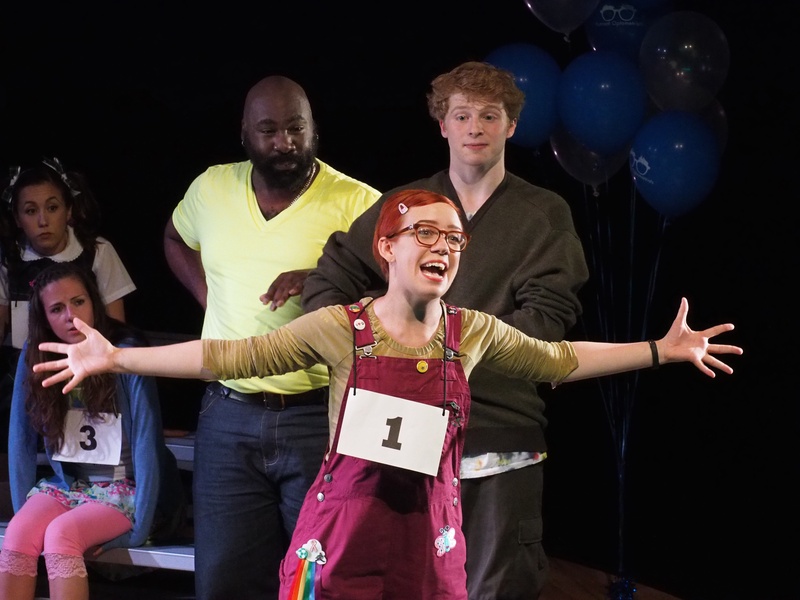 Firlit’s production of The 25th Annual Putnam County Spelling Bee captured all of the emotional back-stories that children bring onto the stage of this annual bee. It dealt with parental support, or lack thereof, methods used to recall spelling, fear of failure, and the need of comfort after things went awry. It made me sympathize with contestants who seem confident and robotic to the public, but below the surface have the same insecurities as everybody else. The musical retains its uniqueness, by inviting four audience members on stage to compete with the six actors in the role of a contestant. You can sign up to participate 30 minutes before the show begins. This would be a once in a lifetime experience for those interested, and adds an extra level of humor as the audience members try to keep up with the actors. The audience is also treated as the audience of the bee. There is additional interaction with the audience, which enhances the performance in this very intimate theater. The scene began with Rona Lisa Perretti (Emily Schexnaydre) entering the gym and having a flashback of winning the bee as a child. 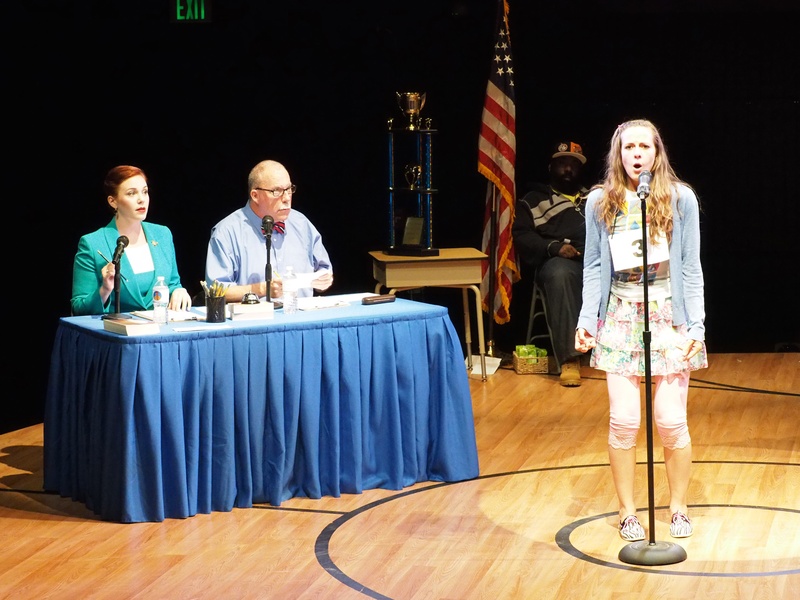 As the spellers are introduced, idiosyncrasies, strengths and deficiencies are divulged. Logainne SchwartzandGrubenniere (Amanda Berry) spells words out with her finger on her arm to get a visual. Dressed in a homemade superhero costume, insecure Leaf Coneybear (Jaime Green) gets a sudden burst of clarity to spell words. Shy Olive Ostrovsky (Charity Farrell) has the dictionary memorized. Nerdy and preppy William Barfée (Ryan Corridoni), dressed in green shorts with blue spouting whales, uses his “magic foot” to spell out words on the floor to get a visual. Boy scout and reigning champion Chip Tolentino (Jonathan Zeng) is easily distracted by girls, and overachiever Marcy Park (Nicole Acevedo) speaks six languages. Perretti calls four audience members to the stage to compete amongst the actors, followed by introducing the official pronouncer Vice Principal Douglas Panch (Patrick James). Panch introduces Mitch Mahoney (Jerrial Young) as the comfort counselor, though his appearance is intimidating to the spellers. He must to assist to fulfill his court mandated community service obligation. The acting was superb by all. I in particular found Jerrial Young intriguing since he offered three personas wrapped into two characters. His supporting role was that of the comfort counselor. He came out with an intimidating urban gait, quickly motioned toward the spellers and made them flinch. He transitioned from a tough guy into a gentle, to one who consoled those who have misspelled a word and must be escorted off the stage. Young also doubled as one of SchwartzandGrubenniere’s gay dads. Two other actors had additional roles. Green also played one of the gay dads, and Zeng played Jesus. There was also some wonderful choreography. Acevedo is very limber having displayed a split and a tilt (standing split), as well as fouettes and ballet jumps. Farell and Corridoni did a fine job swing dancing. The group dances were also entertaining. The set design appropriately consisted of a small gym with championship banners, a desk and chairs for Perretti and Panch, a microphone, and bleachers for the spellers. I noticed a couple of the costumes had changed. Olive originally casted as wearing two braided pigtails, a navy blazer, shirt, tie, and brightly colored pants had a softer hairstyle and a more contemporary look of capri yoga pants, floral skirt, t-shirt and sweater in pastel colors. William Barfée’s character also received a new look from an office employee to a geeky prep in summer attire. I would like to think these changes have been made to appeal to the Princeton community. Melissa Firlit brilliantly revealed the trials and tribulations of annual spelling bees in this production and, and allowed audiences to see how bittersweet the event can be from a child’s perspective. These characters discovered winning isn’t everything, and defeat doesn’t make you are a loser. This is a valuable lesson for all. The humor translated well, the set design was perfect, the costumes felt tweaked for Princeton, and the live music matched with the small theater felt like it was commissioned for a private audience. This is definitely a performance worth seeing. 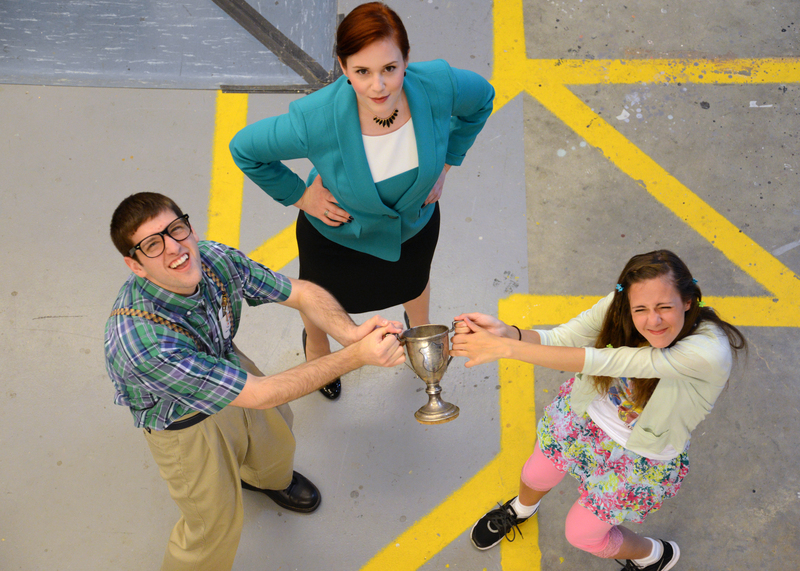 The 25th Annual Putnam County Spelling Bee is playing from June 18 – 28, with the exception of the 23rd and 24th, at the Matthews Acting Studio in Princeton University’s Lewis Center for the Arts on Nassau Street next to Thomas Sweet Ice Cream. Free parking is behind the building accessed from Williams Street off Washington Road. This PG-13 rated one-act musical has a running time of approximately 105 minutes, and there is no intermission. Click here for details and tickets. Have you ever wondered how local or international foods and beverages make their way to Princeton stores? Whether you are a devout foodie or casual home cook, your enjoyment of new culinary delights would grind to a halt if it were not for industry insiders like Princeton resident Wendy Farrington. Farrington is the owner and senior consultant of Caviar & Ketchup, LLC, a retail consultancy group based in town that primarily focuses on specialty fine foods. Working with notable clientele including Dean & Deluca and Home Shopping Network, Farrington has spent more than twenty-five years traveling the globe sourcing products to sell through retail outlets either as-is or branded under a private label. The golden rule by which Farrington operates; know your customer, know your product. Knowing her manufacturing partners is another key part of Farrington’s job, and visiting production facilities comes with the territory. Her favorite trip was when she traveled to within 50 miles of the Arctic Circle to visit Nyåkers Pepparkakor Factory located in Sweden. Nyåkers produces gourmet ginger cookies. “It was so remote the workers arrived at the factory by sled,” recalls Farrington. But Farrington’s core role revolves around analyzing businesses and developing strategic plans to help them grow, plus developing private labels. 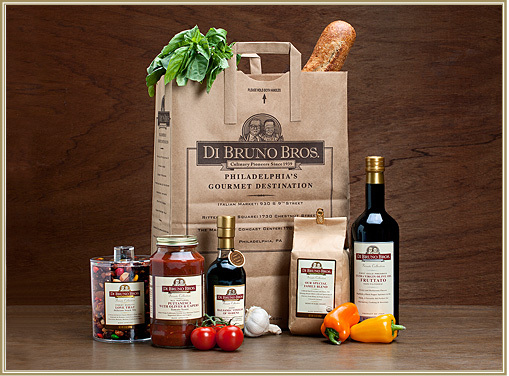 A sample of products Farrington has worked with available to Princeton residents includes the Australian based Bundaberg ginger beer, Philadelphia based DiBruno Brothers pasta, olive oil, snacks and coffee, and Princeton based Twin Hens chicken pot pies. Farrington’s business analysis effects what is made available to the consumer, be it through Home Shopping Network, catalogs, or specialty stores. So, whenever you go to purchase a culinary treat, think about Wendy Farrington and others who bring unusual and exciting flavors to your kitchen table. The Princeton Festival has been bringing quality performing arts programming to town since 2005. This year is no exception. A variety of genres, including jazz, country, Baroque, and Indian music and dance, will entertain audiences this June. Artistic Director Richard Tang Yuk has expanded the offerings since its inception, and this year’s selections are quite impressive. The two productions with multiple performances are the musical The 25th Annual Putnam County Spelling Bee and the opera Le Nozze di Figaro (The Marriage of Figaro). There is a total of 23 performances, 13 free lectures, previews, and demonstrations. The below line up will be held in various venues. Details can be found here. There is also an 8-day professional Conducting Master Class that was open to conductors and auditors by application. The small group of eight conductors and unlimited auditors will fine tune skills. You can experience the conductors of this class leading the Festival chorus. As mentioned earlier, there will be some free events, and a few will take place at the Princeton Public Library. Don’t miss the lecture Mozart 1784 – 1786 & Le Nozze di Figaro on Tuesday, June 2 at 7:00 PM, and the Festival Preview on Thursday, June 4 at 7:30 PM both in the Community Room. There will also be a Pop-Up Performance at Quaker Bridge Mall in their Center Court on Friday, June 5 at 4:00 PM. Check here for an overview of all free lectures and special events. The Princeton Festival’s performances run from June 6 – 27, 2015. For tickets, call 609-258-2787 or visit The Princeton Festival. Fasten your seat belts! The Princeton Reunions Weekend is about to hit us like busloads of tourists unloading at Times Square. About 25,000 alumni and their guests will clog up major road arteries just like a Hoagie Haven Phat Lady coursing through your veins. If the rowers hit the shores of Lake Carnegie it will be reminiscent of the Allied Forces invading Normandy. That would mean vehicles will slow down on the Washington Road Bridge to see this spectacle. In other words, don’t even bother driving through town until Sunday evening. Princeton University is at the top-tier of the ivy league elitist food chain, and carry on the ancient traditions of bad taste. You’ll see old and young painting the town orange and black with the most horrendous clothing imaginable. They would not be caught dead walking the streets of New York or Philly in these outfits, but they will strut their stuff proudly in front of townies. Alums call it school pride, so grown men and women can justify wearing orange and black tiger-striped, plaid, or other patterned blazers and straw boaters in public. Extra points for those sporting the hats cocked to the side. Often, the entire family is decked out in some sort of crazy spirit wear. A few even dress their dogs in tiger costumes. Can you imagine seeing a brood exiting their suburban Ohio home wearing what seems to be Tigger costumes in May? Princeton University is one of the preppiest schools on the planet, so I wouldn’t be surprised if Ralph Lauren added a Tiger print to his Spring ’16 Collection. The P-rade is a must see if you want a really good laugh. The ghost from Princeton past will head the parade, and very enthusiastic disciples in a hypnotic state will follow their fearless leader. Have your cameras or camcorders ready, because words cannot begin to explain this event. Seeing is believing. Princetonians really get the royal treatment once back at their alma mater for the Reunions Weekend. Local merchants roll out the orange carpet to cater to this influx of money bags. Hamilton Jewelers even holds an annual watch fair to coincide with the alum invasion. This lures the beasts out of the confines of the campus and onto the streets. Should we thank merchants for this added entertainment or curse them for causing longer lines? The joke’s on them. Townies strike back by being moochers. Somehow, locals score wristbands to enter their exclusive boozefests. And we also know when they will shoot off fireworks and watch at their expense (shhh! it’s on Saturday, May 30th at Campbell Field, but you didn’t hear it from me). So if you can handle the crowds, head into town and you can see them roaming around like the big cats at Great Adventure’s safari park. Unfortunately, they will not be behind cages. 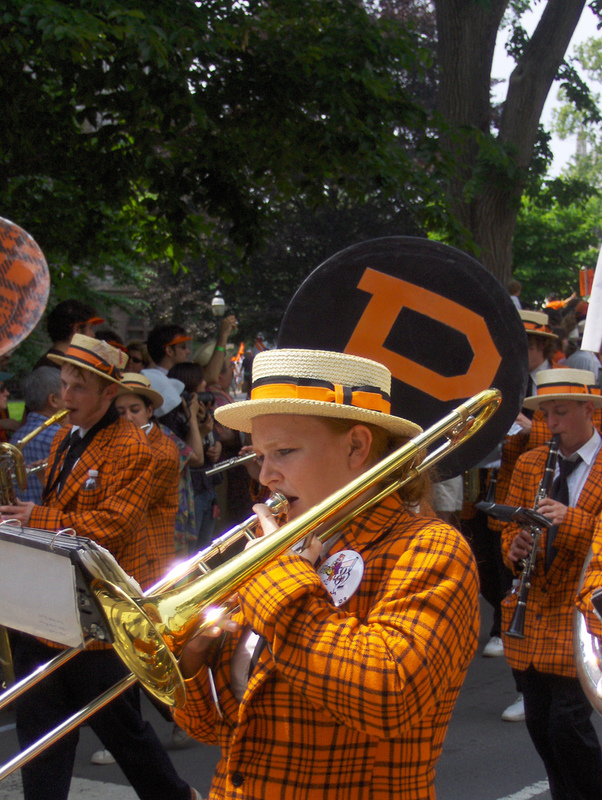 On a serious note, Princeton University demonstrates strong school spirit thanks to century’s old traditions. The big weekend runs from Thursday, May 28 – Sunday, May 31. For those residents who treasure the Town and Gown synergy, you can purchase tickets to encore performances of the Triangle Show’s An Inconvenient Sleuth on Friday or Saturday evening at McCarter Theatre. 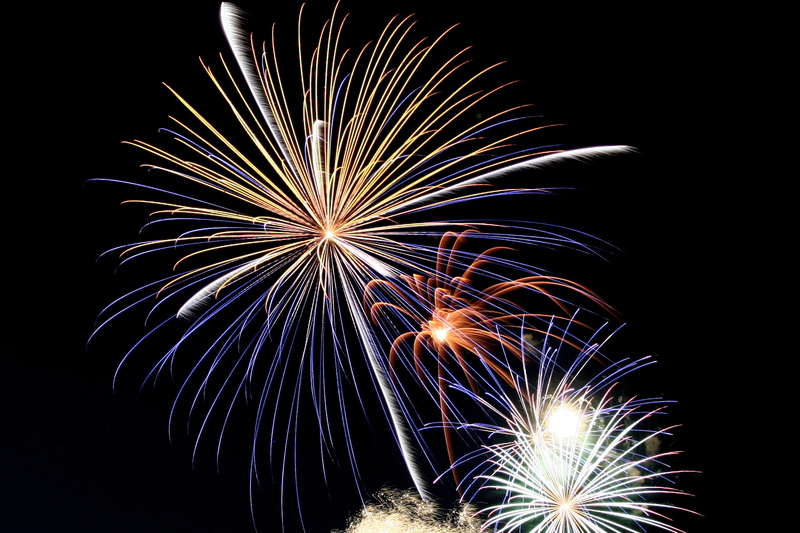 Fireworks will follow the Saturday performance. McCarter Theatre Center presents Five Mile Lake by playwright Rachel Bonds and directed by Emily Mann, which concludes the 2014-2015 Theater Series. The play takes place in a small, economically hard hit, fictitious town near Scranton, PA in winter. It revolves around a small group of 20 somethings, including two sets of siblings, who find themselves at the crossroads of life. 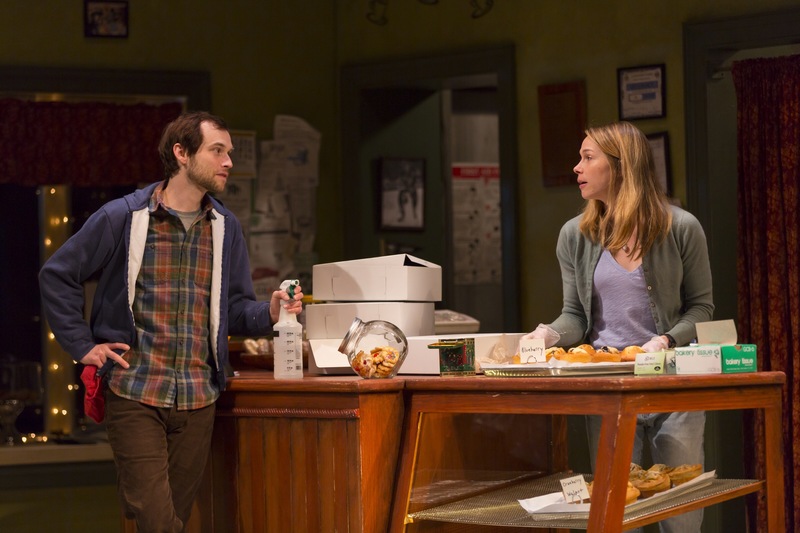 Jamie (Tobias Segal) and Mary (Kristin Bush) are bakery employees. Jamie is content, and is taking pride in renovating the lake house bequeathed to both him and his brother from his grandfather. He is also tending to his mother who lives in her own home. Mary remains in town primarily to support her unemployed brother Danny (Jason Babinsky), who has toured twice in Afghanistan, and suffers from post traumatic stress disorder. Rufus (Nathan Darrow) is Jamie’s brother, who is in the process of writing his Ph.D. dissertation, and unexpectedly returns from New York City for a surprise visit. He does not return often, and his visits are always brief. Rufus brings his girlfriend Peta (Mahira Kakkar), who is an associate editor of a New York magazine. The arrival of Rufus is the catalyst of a series of conversations. Characters begin to reveal layers of their dreams, regrets, and fears as they examine their paths not chosen. Darrow’s and Segal’s performances were wonderful. Each, in keeping to the refrains of their characters, was able to convey a multitude of underlying emotions that resonate with audience members so well, that you can’t help but feel you have known the characters your entire life. Bush’s portrayal of Mary takes the audience on an emotional rollercoaster ride between comedic arguments with Jamie to a soul cracking meltdown. Pivotal moments of the play rests on the shoulders of the two supporting characters, Peta and Danny. Actors Kakkar and Babinsky have relatively short stage time to make the audience connect with their characters. Their dilemmas are a primary source of upheaval. Kakkar successfully captures the essences of a woman silently imploding, while Babinsky brilliantly portrays a man struggling to contain emotional explosions. I will go further to say Babinsky performance stole the show and I challenge anyone to catch him “acting”. Finding a group of such exceptional talent will come as no surprise to McCarter Theater regulars. Audiences might recognize Tobias Segal who recently played Octavius in McCarter’s Antony and Cleopatra. Kristen Bush performed in Proof as Catherine, and Mahira Kakkar as Maryamma in Miss Witherspoon. McCarter Theatre’s Artistic Director Emily Mann consistently finds the perfect plays that appeal to Princeton audiences. Five Mile Lake is beautifully directed so audiences can pick up on the nuances of people in small towns. It would be out of negligence not to mention the amazing scenic design of Edward Pierce. The rotating set displaying the interior and exterior of the bakery, as well as the facade of the lake house, will instantly transform you to their world. Additional sliding props complete the polished feel. Five Mile Lake is a conversation starter that is worth seeing. It runs 90 minutes with no intermission in the more intimate Berlind Theatre until May 31st. Tickets can be purchased online or by calling 609-258-2787.